Bed and Breakfasts near Uttoxeter Racecourse for 1 night from Thu Apr 25, 2019 to Fri Apr 26, 2019 within 25 miles, in an Average Nightly price range of £1 to £200. Only 6 minutes to Alton Towers ! Romantic 4-Poster Suites. Family suites with themed rooms. Sauna and Hot Tub !Nearby 17th Century village pub restaurant, historic Denstone College. One mile from Alton Towers, friendly 17th century home in Alton village. Bedrooms en-suite, TV, tea/coffee, free WiFi, hairdryer and wall fan. Hearty English, vegetarian, vegan, gluten free and dairy free breakfasts. Free car park. Pubs easy walking. The Laurels B&B is situated in overlooking the small village of Oakamoor, with views down The Churnet Valley. We are only 5 minutes from Alton Towers and 10 minutes from the Peak District, so we're perfect for days out, walking and cycling. Situated in historic Cheadle, Park View is a Victorian guest house rated 4 star by the AA and it offers free Wi-Fi and good value accommodation. Alton Towers is just a 10-minute drive away. All of the spacious en suite rooms have comfortable beds and a large screen TV with Freeview. Guests may enjoy an inclusive all-you-can-eat breakfast in the spacious dining room, overlooking the park. The hosts are welcoming and friendly. Relax in the comfortable guest lounge and games room, with pool table. There are tennis courts and football pitches opposite the house. Park View Guest House is within easy walking distance of many pubs and restaurants. Free parking is available. Park View Guest House provides quality family friendly accommodation in the beautiful town of Cheadle. Whilst we are close to Alton Towers we are also perfectly positioned for visiting the natural beauty of the Staffordshire Moorlands and the Peak District. 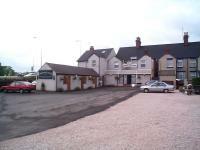 The are plenty of pubs and restaurants within easy walking distance and free onsite parking. A warm welcome awaits you at Park View. Set in a Georgian country house in 6 acres of land is Abbot's Haye guest house. A licensed bar and free Wi-Fi are available at the property. Free parking is possible and Alton Towers, a popular theme park, is just a 10-minute drive away. Rooms feature traditional decor and include a TV and tea and coffee making facilities. Each room has a private bathroom with a hairdryer. A full English breakfast is served in the Abbot's country-house style dining area. Hill walking is possible in the surrounding Peak District countryside. Cheadle Town centre and St Giles Church, with its 200 foot spire, are 5 minutes' drive from the guest house. Offering a restaurant, free WiFi and on-site parking, The Cross Inn is located just 8 minutes' drive from Alton Towers Theme Park. In the village of Cauldon Lowe, Dovedale National Nature Reserve is 25 minutes' drive away and Waterworld is 15 miles away. Each room includes a TV, a DVD player and a CD player. There is also an electric kettle. Featuring a shower, the private bathrooms also come with a bath and a hairdryer. Extras include a washing machine, an outdoor seating area and ironing facilities. At The Cross Inn there is a spacious garden, barbecue facilities and a bar. Other facilities offered at the property include meeting facilities, a games room and a children's playground. The small market town of Bakewell, well known for its confection, is 23 miles away. Britannia Stadium, home of Stoke City Football Club, is a 27-minute journey by car.